1. The UAEJJF Jiu-Jitsu President’s Cup (“JJPC”) is a UAEJJF competition embodied in the UAEJJF Statutes. 2. The UAEJJF Jiu-Jitsu President’s Cup takes place 3 times a year. 3. Participation in the UAEJJF Jiu-Jitsu President’s Cup is open to all UAE Clubs. 4. Any rights that are not ceded by the Regulations for the UAEJJF Jiu-Jitsu President’s Cup 2018-2019 (“Regulations”) to the Organizing Committee or any participating club or any member association or to a Ju-Jitsu International Federation shall remain with UAEJJF. 5. The UAEJJF Statutes and all UAEJJF Regulations in force shall apply. Any reference in these Regulations to the UAEJJF Statutes and regulations refers to the Statutes and Regulations valid at the time of championship. 1. Open only to UAE clubs and UAE nationality or Citizens Born in UAE. 2. There should not be more than one participating clubs from the same member association in the UAEJJF President's Cup (For example Team A, Team B). 3. 6. Ensure the provision of adequate insurance to cover their Delegation Members and any other persons carrying out duties on their behalf against all risks, including but not limited to injury, accident, disease and travel in consideration of the relevant UAEJJF rules or regulations (if applicable). 5. excerpts or clips from footage of the matches of the relevant competition described in art. 4 par. 1 in which the club took part, of a maximum duration of three minutes per match. 4. 16. excerpts or clips from footage of the matches of the relevant competition described in art. 4 par. 1 in which the club took part, of a maximum duration of three minutes per match. 5. All participating clubs shall confirm their participation by submitting the originals of the official registration online and any other required documentation as communicated by UAEJJF by the deadline(s). 1. To ensure the integrity of the Jiu-Jitsu President’s Cup, no participating club, individual or legal entity may, either directly or indirectly, have control or influence over another participating club or clubs. 2. If two or more participating clubs fail to meet the above criterion aimed at ensuring the integrity of the Jiu-Jitsu President’s Cup, UAEJJF shall decide on the matter at its sole discretion and take whatever action is deemed necessary. 3. Clubs that are not admitted shall be replaced. 1. All participating clubs undertake to play all of their matches until eliminated from the Jiu-Jitsu President’s Cup. 2. Any club that withdraws from the Jiu-Jitsu President’s no later than last match shall be fined at least AED 3,000 by the UAEJJF Disciplinary Committee. Any club that withdraws from the Jiu-Jitsu President’s Cup before the first match shall be fined at least AED 6,000 by the UAEJJF Disciplinary Committee. 3. Depending on the circumstances of the withdrawal, the UAEJJF Disciplinary Committee may impose additional disciplinary measures, including the expulsion of the participating club concerned from a UAEJJF competition. 4. Any match which is not played or which is abandoned – except in cases of force majeure recognised by UAEJJF – may lead to the imposition of disciplinary measures against the relevant clubs and/or the expulsion of the clubs concerned from the Jiu-Jitsu President’s Cup by the Disciplinary Committee in accordance with the Disciplinary Code. 5. Any participating club that withdraws or whose behaviour is liable for a match not being played or being abandoned may be ordered by the UAEJJF Organising Committee to reimburse UAEJJF and the Organising Association for any expenses incurred as a result of its behaviour. In such cases, the participating club concerned may also be ordered by the UAEJJF Organising Committee to pay compensation for any damages incurred by UAEJJF or the Organising Association. The participating club in question will also forfeit any claim to financial remuneration from UAEJJF. 6. If a participating club withdraws or a match cannot be played or is abandoned as a result of force majeure, UAEJJF shall decide on the matter at its sole discretion and take whatever action is deemed necessary. 7. 7. the kick-off time, date and location of the match shall be decided by UAEJJF. If any participating club withdraws or is excluded from the competition, UAEJJF shall decide on the matter at its sole discretion and take whatever action is deemed necessary. The competent UAEJJF body may in particular decide to replace the club in question with another club. 1. Disciplinary infringements are dealt with in compliance with the UAEJJF Disciplinary Code in force as well as with all relevant circulars and directives, with which the participating clubs undertake to comply. 2. UAEJJF may introduce new disciplinary rules and sanctions for the duration of the Jiu-Jitsu President’s Cup. Such rules shall be communicated to the participating clubs one month before the first match of the Jiu-Jitsu President’s Cup at the latest. 3. The participating clubs and their Delegation Members agree to comply with the Rules Book and with the UAEJJF Competition regulations, in particular the UAEJJF Disciplinary Code, the JJIF Anti-Doping Regulations, UAEJJF Code of Conduct for the UAEJJF Jiu-Jitsu President’s Cup 2018, as well as with all guidelines, circulars, directives and decisions of UAEJJF bodies unless these Regulations stipulate otherwise. 4. 4. refrain from doping as defined by the JJIF Anti-Doping Regulations. 4. 5. Any violation of these Regulations or any other UAEJJF regulations, circulars, guidelines, directives and/or decisions that does not come under the jurisdiction of another body shall be dealt with by the UAEJJF Disciplinary Committee in accordance with the UAEJJF Disciplinary Code. 1. All disputes in connection with the UAEJJF Jiu-Jitsu President’s Cup shall be promptly settled by mediation. 1. For the purpose of these Regulations, protests are objections of any kind related to events or matters that have a direct effect on matches, including but not limited to the state of and markings on the pitch, accessory match equipment and stadium installations. 2. Unless otherwise stipulated in this article, protests shall be submitted in writing to the UAEJJF Head of Referee within two 5 minutes of the end of match in question and followed up with a written report, otherwise they will be disregarded. 3. Protests regarding the eligibility of players nominated for matches shall be submitted in writing to the UAEJJF Disciplinary Committee no later than hours before the first match of the Jiu-Jitsu President’s and shall be dealt with by the UAEJJF Disciplinary Committee. 4. No protests may be made about the referee’s decisions regarding facts connected with play. Such decisions are final and not subject to appeal, unless otherwise stipulated in the UAEJJF Disciplinary Code. 5. If an unfounded or irresponsible protest is lodged, the UAEJJF administration will inform the UAEJJF Disciplinary Committee, which may impose disciplinary measures. 6. If any of the formal conditions of a protest as set out in these Regulations are not met, such protest shall be disregarded by the competent body. Once the final match of the Jiu-Jitsu President’s has ended, any protest described in this article shall be disregarded. 7. The UAEJJF Organising Committee shall pass decisions on any protests lodged, subject to the exceptions stipulated in these Regulations, the UAEJJF Statutes or any other UAEJJF regulations. 1. In order to prevent players from experiencing sudden cardiac death during matches in the UAEJJF Jiu-Jitsu President’s Cup, and to protect players’ health, each participating club shall ensure that its players undergo a pre-competition medical assessment prior to the Jiu-Jitsu President’s . 2. Failure to comply with the aforementioned provision shall be sanctioned by the UAEJJF Disciplinary Committee in accordance with the UAEJJF Disciplinary Code. 3. Doping is strictly prohibited. Anti-doping rule violations are defined in the JJIF Anti-Doping Regulations and sanctioned in accordance with the JJIF Anti-Doping Regulations and the UAEJJF Disciplinary Code. 4. UAEJJF will inform the participating clubs of the doping control procedures and the list of prohibited substances by means of a cicular letter. 5. The UAEJJF Disciplinary Code, the JJIF Anti-Doping Regulations and all other relevant UAEJJF regulations and directives will apply to the Jiu-Jitsu President’s. 3. if the player is registered for his club as a professional, existence of a written employment contract binding the professional player to his club and meeting the requirements concerning minimum and maximum length. 2. Infringements concerning the eligibility of players shall be decided by the UAEJJF Disciplinary Committee in accordance with the UAEJJF Disciplinary Code. 3. The participating clubs are responsible for fielding only eligible players. Failure to do so will lead to the disciplinary measures stipulated in the UAEJJF Disciplinary Code. 1. The date of the brackets draw for the UAEJJF Jiu-Jitsu President’s Cup will be communicated by circular letter. 2. The draw will be organised by UAEJJF and the Organising Association and shall be combined with a Team Workshop (and other related activities). 2. The first round match will be played between the representative. The losing clubs from the semi-finals will contest the single elimination for third place. 3. If the last match is drawn at the end of normal playing time, extra time shall be played (one period of 2 minutes until first player score an advantage or point = Golden Score). If matches are level at the end of normal playing time, no extra time shall be played and the winner shall be determined by number of victories or the original criterias from the penalty mark in accordance with the procedure described in the Competition Regulations - Round Robin Criteria. 1. The venues, dates and fight times of the matches shall be proposed by the Organising Committee. 2. UAEJJF shall fix the dates and times of the matches, allowing each team a minimum rest period of 15 minutes between matches. 3. Each team participating in the Jiu-Jitsu President’s shall arrive at the venue of their first match at least 1 hour before the team’s first match. 1. The fields of play, mats, accessory equipment and all facilities for each match of the UAEJJF Jiu-Jitsu President’s shall be in optimum condition and comply with the Rules Book and all other relevant regulations. 1. Each warm up shall have sufficient space to allow the players to warm up before the matches. A maximum of each category shall warm up at the same time (with a maximum of one coaches for each team). For exemple one coach for U18, one coach for U21 and one coach for A21. 1. Flags will be displayed in the stadium in accordance. 1. Each participating club shall submit online a provisional list of no more than 6 players by the deadline stipulated in the related circular. A signed copy of this list must also be sent to UAEJJF by the same deadline. The provisional list shall include the full name, date of birth, passport information, weight class and name, nationality and all other information as required in the online registration system. 2. Any change requests to the online list for exceptional cases must be submitted before the final list deadline and are subject to UAEJJF’s approval. 3. Only the 6 players on the final list of players will be permitted to take part in the Jiu-Jitsu President’s . Players must wear back numbers with their respective weight class, provided that the player is registered with the same weight class. 4. In addition, a final list of 2 officials/coaches shall be submitted online with the final list of players. first match of his team. The replacement shall be nominated by the participating club, which shall inform UAEJJF accordingly. Such replacements must be approved in writing by the UAEJJF General Officer. 6. The final club list of 6 players will be published by UAEJJF. 10. Before the start of the Jiu-Jitsu President’s , every player and official on the final list must prove their identity by producing their legally valid individual passport with photograph. Any player or official who fails to submit this document will not be allowed to take part in the Jiu-Jitsu President’s . 11. UAEJJF shall provide the players and officials included on the final list with an official accreditation bearing a photograph. Additional accreditations for officials may be granted to clubs if it can be demonstrated that the role of a member of staff requires them to access team areas. UAEJJF shaII take the final decision on the granting of additional accreditations. 12. Injured players who are replaced up until 24 hours before the first match of their team must return their accreditation to UAEJJF. Accordingly, players who have returned their accreditation shall no longer be considered members of the participating club’s final list. 13. The participating clubs shall ensure that all accreditation data, passport copies and photographs required by UAEJJF are submitted by the deadline stipulated by UAEJJF. Further details will be outlined in a circular letter. 14. UAEJJF reserves the right to revoke the accreditation of any official or player due to the misconduct of the individual concerned. 1. Each team is responsible for arriving at the stadium at the latest 60 minutes before the first match of the respective match and for providing the completed start list to the UAEJJF General Coordinator upon arrival. 2. All 6 players shall be named on the start list for each match (3 selected players and 3 substitutes). Up to a maximum of three of the substitutes may take the place of the selected players at any time during the competition in case of injury. 3. The numbers on the players’ kimono must correspond to the numbers indicated on the start list. The start list shall be signed by the head coach. 4. Each team is responsible for ensuring that the start list is completed properly and submitted on time, and that only the selected players start the match. In the case of any discrepancies, the matter will be submitted to the UAEJJF Disciplinary Committee. 4, If any of the 3 starting players submitted on the start list are not able to begin the match due to injury or illness, they may be replaced by any of the eligible substitutes as long as the UAEJJF General Coordinator is officially informed within 1 hour, the team concerned must also provide UAEJJF with a medical report issued by the team doctor responsible. 5. Further to the above, any injured or ill player who is removed from the start list will no longer be eligible to take part in the match, and thus cannot be selected as a substitute player at any time during the game. Such a change to the start list will not reduce the number of official substitutions that may be made by a team during the match. 6. Only the players who were identified on the official start list submitted to the UAEJJF General Coordinator, or were confirmed as a warm-up injury/illness replacement player, may start the match. In the case of any discrepancies of players on the pitch at the beginning of a match, the matter will be submitted to the UAEJJF Disciplinary Committee. No more than 4 people (3 players and 1 official/coach) shall be allowed to sit on the substitutes’ bench. The names of these officials must be indicated on the “Officials on the Player’s Bench” form to be provided to the UAEJJF General Coordinator. A suspended player or official will not be allowed to sit on the substitutes’ bench. 8. The use of any communication equipment and/or systems between and/or amongst players and/or technical staff is not permitted. 1. The participating clubs shall comply with the UAEJJF Equipment Regulations in force, which shall apply to the Jiu-Jitsu President’s pursuant to article 1 paragraph 3 of the UAEJJF Equipment Regulations. If a provision of this article 23 is in conflict with the relevant provision of the UAEJJF Equipment Regulations, the provisions of this article 23 shall prevail as lex specialis. 2. The display of political, religious and personal messages or slogans in any language or form by players and officials on their playing equipment items, special equipment items or other equipment items (including kit bags, beverage containers, medical bags, etc.) or body is prohibited. The similar display of commercial messages and slogans in any language or form by players and officials is not allowed for the duration of their time at any official activity organised by UAEJJF (including in the stadiums for official matches and training sessions, as well as during official media conferences and mixed-zone activities). Any violations shall be dealt with by the UAEJJF Disciplinary Committee in accordance with the UAEJJF Disciplinary Code. Each team shall inform UAEJJF of two different and contrasting colours (one predominantly dark blue or black and one predominantly white). The advertising of tobacco or strong alcoholic beverages, as well as slogans of a political nature or of a discriminatory nature, comprising any form of discrimination such as gender, religion, nationality, race or creed, or in any other form offending common decency, are prohibited. 5. Recognition for a participating club’s sponsor on playing kits is permitted. 6. Players’ names and weight classes. Throughout the Jiu-Jitsu President’s , each player shall wear the weight class assigned to him on the final list. Such weight class shall be displayed on the back of each of his playing gis and on the front of the pants in accordance with the UAEJJF Equipment Regulations. The same number may, at the participating club’s discretion, be displayed on the front of the kimono, in which case the display must comply with the UAEJJF Equipment Regulations. 7. 1. The referees, assistant referees and fourth officials (hereinafter referred to collectively as “match officials”) for the Jiu-Jitsu President’s shall be appointed for each match by the UAEJJF Referees Committee. They shall be selected from the UAEJJF International Refereeing List in force and come from a member association that is not represented by a team playing in the match in question. The decisions of the UAEJJF Referees Committee are final and not subject to appeal. 7. 2. If the referee or one of the assistant referees is prevented from carrying out his duties, such referee or assistant referee shall be replaced by the fourth official. 7. 3. After each match, the referee shall complete and sign the official UAEJJF report form. The referee shall hand it over to the UAEJJF General Coordinator at the stadium immediately after the match. On the report form, the referee shall note all occurrences of significance, such as misconduct of players leading to caution or expulsion, unsporting behaviour by supporters and/or by officials or any other person acting on behalf of a participating club at the match and any other incident happening before, during and after the match in as much detail as possible. All matches shall be played in accordance with the UAEJJF Rules of the Game in force at the time of the Jiu-Jitsu President’s and as laid down by the Ju-Jitsu International Federation Board. In the case of any discrepancy in the interpretation of the translations of the Rules of the Game, the English version shall be authoritative. 1. A representative from UAEJJF will present the winner of the Jiu-Jitsu President’s with the UAEJJF Jiu-Jitsu President’s Cup trophy from the results of three rounds. 2. UAEJJF will present the winner of the Jiu-Jitsu President’s with Medals for each rounds. 3. A souvenir plaque will be presented to each participating club at the end of three rounds. 4. A diploma will be presented to the clubs ranked first, second, third and fourth in the Jiu-Jitsu President’s . 5. Medals will be presented to each of the top three teams in the Jiu-Jitsu President’s , i.e. gold medals to the winners, silver medals to the runners-up and bronze medals to the team ranked third. The Golden Kimono will be awarded to the best player in the UAEJJF Jiu-Jitsu President’s Cup on the basis of a ranking compiled of 3 events by the Technical Study Group. 7. There are no official awards other than those listed above, unless otherwise decided by UAEJJF. 1. UAEJJF is the original owner of all of the rights emanating from the Jiu-Jitsu President’s and any other related events under its respective jurisdiction, without any restrictions as to content, time, place and law. 2. UAEJJF owns and controls all intellectual property rights relating to the Jiu-Jitsu President’s , including, without limitation, rights relating to the UAEJJF marks and the marks of the Jiu-Jitsu President’s , including the translations thereof, the official emblem, any official poster(s), the official mascot (if applicable) and the official music (if applicable) on a universal basis. Only these marks may be used in connection with the Jiu-Jitsu President’s . All of UAEJJF’s marks and those connected with the Jiu-Jitsu President’s may only be used in accordance with the guidelines determined by UAEJJF. 3. UAEJJF owns and controls all marketing rights and media rights in relation to the Jiu-Jitsu President’s and has the sole right, to the exclusion of the Organising Association, the participating clubs, the coaches, the players and any third party, to exploit itself or through a third party, at its own discretion and on a universal basis, any and all marketing rights and media rights in relation to the Jiu-Jitsu President’s . UAEJJF will issue Media and Marketing Regulations specifying these marketing rights and media rights. All participating clubs shall fully comply with these regulations and ensure that their members, officials, players, delegates and other affiliates also comply. 4. For the purposes of these Regulations, “marketing rights” shall mean all rights of exploitation of the Jiu-Jitsu President’s (other than media rights described in art. 30 par. 5 below), all advertising, including electronic and virtual promotion, marketing, merchandising (including but not limited to publications, music, coins, stamps, DVDs, videos, apparel and electronic games of any nature), licensing, franchising, sponsorship, ticketing, hospitality, betting/gaming, publications, database rights, and any other rights and/or associated commercial opportunities relating to or in connection with the Jiu-Jitsu President’s , including advertising, franchising, displaying, sampling and selling rights of any nature at the stadiums and other official sites. 5. For the purposes of these Regulations, “media rights” shall mean the right to film, photograph, record, broadcast, transmit and/or display the Jiu-Jitsu President’s , including all recordings thereof (or any part thereof) in any form and in all media now known or hereafter devised, including but not limited to television, radio, internet and any other mobile or fixed-line broadcasts or data services. 6. 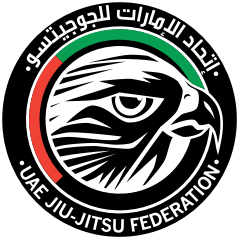 UAEJJF has the exclusive royalty-free right to produce and sell goods bearing the official name, nickname, official mascot, official emblem and/or official symbol of a participating club or clubs together with the UAEJJF marks and/or the marks of the Jiu-Jitsu President’s , provided that all such goods are otherwise unbranded. Participating clubs shall, upon request, provide notification to UAEJJF of their acknowledgement of this provision. 7. Participating clubs and their players shall inform their commercial affiliates, including but not limited to any sponsors, licensees and media rights licensees, that they have no marketing rights or media rights in connection with the Jiu-Jitsu President’s , in particular, that they may not conduct any promotional activities which involve the use of the official emblem, the official mascot(s) or any marks which are confusingly similar to UAEJJF’s marks or those relating to the Jiu-Jitsu President’s . Participating clubs and their players shall assist UAEJJF in resolving any intellectual property infringements or ambush marketing activities involving the participating clubs’ or players’ commercial affiliates, and participating clubs and players are expressly prohibited from identifying their commercial affiliates in connection with the official emblem or name of the Jiu-Jitsu President’s or any other marks of the Jiu-Jitsu President’s or UAEJJF marks in any media (including but not limited to any promotional materials) in such a way as may give rise to an association between the participating clubs’ and players’ commercial affiliates and the Jiu-Jitsu President’s . 8. UAEJJF may appoint a “Title Sponsor” who shall have the right to have its name associated with the title of the Jiu-Jitsu President’s and displayed on the official competition logo of the Jiu-Jitsu President’s . The Title Sponsor may also be granted the right to present a prize to the best player of the Jiu-Jitsu President’s (cf. art. 28 par. 8c)). 9. A participating club may establish its own Team Media Centre (“TMC”) before and during the Jiu-Jitsu President’s if it wishes to do so. All costs involved in the installation and management of TMCs shall be solely borne by the participating club concerned. 10. The participating clubs, their officials and their players accept that UAEJJF has the royalty-free right to use, and/or sub-license the right to use, in perpetuity and in any medium known or hereafter devised, any of the records, names, marks and images of the participating clubs and their officials and players, including any representation thereof, which may appear or be generated in connection with their participation in or involvement with the Jiu-Jitsu President’s , solely for the purposes of promoting audiovisual coverage of the Jiu-Jitsu President’s . UAEJJF’s right in this provision shall be exclusive in relation to the Jiu-Jitsu President’s . 11. UAEJJF’s internet website will be the only official website for the Jiu-Jitsu President’s . UAEJJF has full control over the content, appearance and related activities of UAEJJF’s website. 12. UAEJJF will take all legal and any other steps it deems appropriate to prevent and prohibit unauthorised persons and/or companies, including the participating clubs’ or players’ commercial affiliates, from commercially identifying with, or otherwise exploiting, the Jiu-Jitsu President’s . 13. 2. use and/or authorise any third party (including participating clubs’ and players’ commercial affiliates) to use tickets for advertising, sales promotions or any other commercial purposes (including premiums, giveaways or prizes in competitions, contests or sweepstakes). 14. Participating clubs shall refrain from the development, use or registration of any name, logo, trademark, indicia, brand name, symbol, service mark or other mark (whether registered or unregistered) or designation which may be inferred by the public as identifying with UAEJJF or the Jiu-Jitsu President’s , including the words “Club World”, “JJPC”, “UAEJJF”, “Jiu-Jitsu President’s Cup” (or any other term used in any language to identify with the Jiu-Jitsu President’s ), or the development, use or registration of any dates in connection with the name of the host country, venues or host cities of the Jiu-Jitsu President’s , or any similar indicia or derivation of such terms or dates in any language. The participating clubs shall further ensure that their commercial affiliates comply with the provisions of this article, and that such commercial affiliates do not engage in any activity which might give rise to the impression that such commercial affiliates are officially associated with the Jiu-Jitsu President’s . 15. Participating clubs shall not oppose any of the trademark or copyright applications filed by UAEJJF or its affiliates, nominees or licensees in respect of UAEJJF’s marks. Participating clubs shall not in any way challenge, or apply for any copyright, trademark, or patent protection, or domain name registration (whether in respect of, or in relation to UAEJJF’s marks or otherwise) which would adversely affect the relevant owner’s proprietary interests in UAEJJF’s marks, or assist any other person to do so. 16. For the avoidance of doubt, the participating clubs and their players shall remain free to exploit their own proprietary rights (including intellectual property rights) which are unconnected with the Jiu-Jitsu President’s . circumstances that may arise in the host country. These instructions shall form an integral part of these Regulations. Any matters not provided for in these Regulations and any cases of force majeure shall be decided by UAEJJF. All decisions shall be final and binding and not subject to appeal. In the case of any discrepancy in the interpretation of the English and Arabic texts of these Regulations, the English text shall be authoritative. These Regulations were approved by the UAEJJF Council in June 2018 and came into force immediately.